MOGADISHU — Al Shabaab stormed Somalia's parliament on Saturday, killing at least 10 security officers in a bomb and gun assault that the United Nations called "an attack against the people." The attack — by the al Qaeda-linked group that killed 67 people at a Kenyan shopping mall last year — started with a car bomb at a gate to the heavily fortified parliament compound, followed by a suicide bombing and then a gun battle which continued for hours. "Ten government forces died and 14 others were injured in the attack today. Four lawmakers were also injured. Seven of the fighters who attacked the house were also killed as you see their bodies," Kasim Ahmed Roble, a police spokesman, told reporters at the scene. A spokesman for al Shabaab, Sheikh Abdiasis Abu Musab, said that the group's fighters had killed 30 people. "We killed 30 from the AU (African Union) and from the various forces of the so-called Somali government," he said. Reuters witnesses saw four bodies at the scene and saw a soldier fall from a rooftop after being shot. Reuters television pictures showed a large pool of blood near a blast site, and a man with his shirt drenched in blood running away from the scene. "We are behind the suicide bombing, explosions and the fighting inside the so-called Somali parliament house, and still heavy fighting is going on inside," said the al Shabaab spokesman. The African Union Mission in Somalia (AMISOM) said in a statement that all the lawmakers who were in parliament before the attack were safely evacuated. 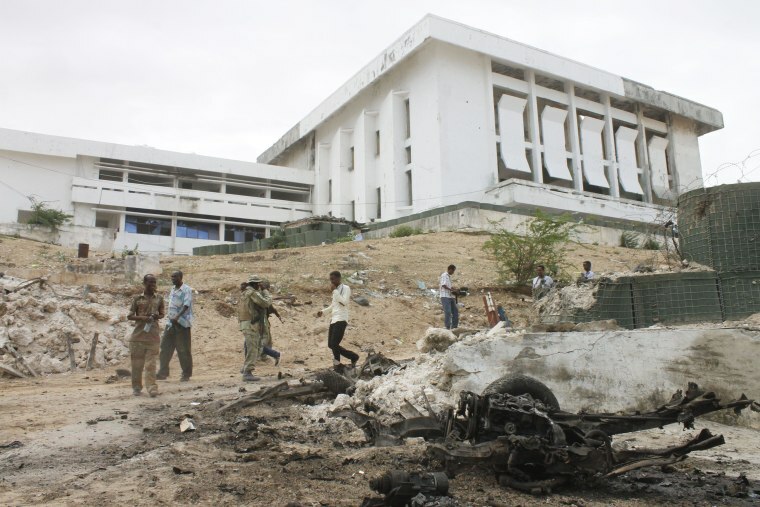 The attack on parliament, a building about 300 meters (yards) from the president's palace that is guarded by African Union peacekeepers and Somali forces, showed that the al Qaeda-linked group remains capable of hitting the center of Mogadishu despite being pushed out of the capital two years ago.